Having spent several years working in the restaurant biz, I’ve made a lot of macarons. These sweet little almond-meringue sandwiches are a standard confection on fine-dining petit fours plates, so if I spend long enough at any one place, I know they are bound to come up in the rotation at some point. (I worked for one pastry chef who used to have side-by-side piping races with me everyday…he usually won, but then again, he had years more experience and he would always try to slow me down by making me giggle.) Macarons are also quite en vogue right now, both in pastry shops and in the blogoshpere, but this is their first appearance here…in fact, I had never made them at home before Ami chose them as this month’s Daring Bakers’ challenge. Macarons can be tricky little things, even when you have made countless batches. Sometimes you pipe them out and are convinced that they will be perfect, only to bake them and have them come out misshapen or with no feet. Other times you are convinced that something has gone wrong, and then they bake up spot-on. And you really never know how it will go when you make a recipe that is not the one you are used to. I will say that this is not my best batch ever, but…ummm…it’s not my worst either. I think I underbaked them a bit, but that is an easy enough problem to fix. The recipe that follows makes very basic almond macarons. But think of it as just a starting point…you can experiment by combining different nut flours and flavorings or add coloring. Some good filling options include buttercream, ganache, caramel and jam. There are endless possibilities for experimentation here, and that, to me, is the cool thing about macarons. I took inspiration from what I had in the house to come up with a strawberry cheesecake flavored macaron. I blitzed some freeze dried strawberries (bought at TJs) that I had in the cupboard to a fine dust in my spice grinder. I added a few grams of this powder, along with a tiny bit of powdered red food coloring to enhance the pink hue, in with my dry ingredients. To fill the macarons, since I didn’t feel like making a large batch of buttercream and I didn’t have any cream to make a ganache, I whipped a little cream cheese with some powdered sugar and vanilla bean paste. I piped a little blob of this “cheesecake” mixture onto one half of each macaron and smeared a little strawberry jam on the other half before sandwiching them together. P.S. : The chocolates you see alongside my strawberry cheesecake macarons are from Bond Street Chocolate, a funky little shop here in the East Village. -Beat the egg whites in the clean dry bowl of a stand mixer until they hold soft peaks. Slowly add the granulated sugar and beat until the mixture holds stiff peaks. -Sift a third of the almond flour mixture into the meringue and fold gently to combine. If you are planning on adding zest or other flavorings to the batter, now is the time. Sift in the remaining almond flour in two batches. Be gentle! Don’t overfold, but fully incorporate your ingredients. -Spoon the mixture into a pastry bag fitted with a plain half-inch tip (Ateco #806). You can also use a Ziploc bag with a corner cut off. It’s easiest to fill your bag if you stand it up in a tall glass and fold the top down before spooning in the batter. -Pipe one-inch-sized (2.5 cm) mounds of batter onto baking sheets lined with nonstick liners (or parchment paper). -Bake the macaroon for 5 minutes. Remove the pan from the oven and raise the temperature to 375°F (190°C). Once the oven is up to temperature, put the pans back in the oven and bake for an additional 7 to 8 minutes, or lightly colored. -Cool on a rack before filling. These look so dainty, I hope the ones I’m planning to make this weekend look half as good. oh they look so delicous and pretty. Ciao ! I knew yours would have been great ! I love the flavour you chose too !! I love the color of your macarons! And grinding freeze dried strawberries is a great idea…I’ll have to file that one away. Congrats on your successful macs! Beautiful! Yours are so perfect 🙂 Experience counts! I love the idea of a macaron piping race – I’d lose though 🙂 And those really are lovely looking chocolates. You can never go wrong with strawberry cheesecake either! Your cookies are beautiful! And you are so right, these are quite temperamental. Now that I’ve read a few posts about macarons, I think I may be up for trying them. They look so intimidating! Beautiful colour. I struggled with this recipe, I must admit. Sort of adapted it along the way because I felt in parts it was a little vague! Will stick with my Italian version, I think. I’ve been wanting to try these since I read Confections of a Closet Master Baker. Unfortunately, that coincided with my return to Weight Watchers, but Christmas is coming and I intend to try my hand at these. Yours look and sound delightful. These are just so beautiful, the colour is so right! I must admit I get a bit intimidated by macarons but I think you have inspired me to give them a go! Oh, cool about using the TJ’s freeze dried fruit. I’m so going to do that to make more macarons. Your macarons look fabulous! Hi Sonu. Thanks for stopping by. I had the macaroons on a plate for the photo. The plate was quite large, so I was able to make it take up the full background space. I love your choice of flavors. How much ground strawberry powder did you have to use to get the flavor to come out? I think I did about 4 grams for my batch…but my batch was small, only using two whites. The strawberry jam that I used as part of the filling also added to the flavor. These look beautiful… just lovely! Oooh! They look beautiful! I love the strawberry cheesecake idea too. I used some freeze-dried raspberries from Whole Foods to make mine. Worked great. Love your macs & the flavouring…how intriguing. Also loved the story about the piping race…lol!! I love the color you got on your macarons! Great job on the challenge! I am quite jealous of your beautiful macarons! I was praying for feet, yet none arrived. If you ever consider teaching an inadequate baker the tricks of the trade, let me know, and I will be on the next plane! Beautiful job. Beautiful and they sound tasty too! 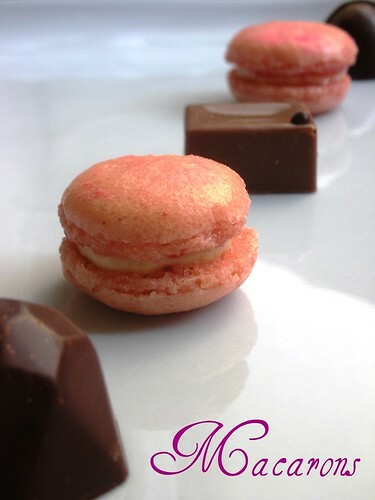 Strawberry cheesecake macarons – mmm, delicious! Oooh, I’m jealous… they look fantastic! and sound yummy too. Neat idea with the freeze dried strawberries. They look lovely! I kept coming round to look for your macs but they werent posted yet…. Great, great macs! So very dainty and pretty. The colour is just perfect (I really had trouble judging how much colour to add). Btw, love the new header :). Your strawberry macarons remind me of collectible little pink buttons! Lovely work. Thank you for sharing your tips along with this recipe. I’ve never attempted macaroons and doubt I will soon, with the current almond price here in Costa Rica, but when I go stateside in Dec. I hope to try these out with my mother. I know they’d be a hit, and really impress my family! You did a fabulous job! Thanks for sharing all your experience with us. Wow very very good result using the DB recipe beautiful colour and the flavour sounds delicious superbly done. Bravo and the photo looks lovely. Cheers from Audax in Australia. Gorgeous macarons! I’ve made strawberry cheesecake flavoured ones before too.The overall effect was quite sweet but I quite liked it all the same. I love the picture with the chocolates, they look great! Looooooooooove the idea of a cheesecake flavoured macaron! Awesome!